Julia McNerney and Micenas are the winners of the Ariat National Adult Medal during the eighth week of the 2011 FTI Winter Equestrian Festival. Photo © Sportfot, Official Sport Photographer of the FTI Winter Equestrian Festival, www.sportfot.com. Wellington, FL - March 4, 2011 - Crowds of spectators were out today to enjoy the sunshine, compete, and watch the competition at the 2011 FTI Winter Equestrian Festival, now in its eighth of 12 weeks. Among the competition today was the group of adult riders competing for the top award in the Ariat National Adult Medal. Besting a field of fourteen horse and rider combinations, Julia McNerney came out on top after two rounds of competition. McNerney was aboard Micenas, an Argentinian Warmblood mare, owned by Norgan Inc. "I'm leasing her for this year; and this was our fourth time showing together. She's been so great. I really can't complain," beamed McNerney about her new partnership with Micenas. The class was comprised of two rounds, both of which were over fences. The first round was a course of nine fences, which contained a bending line and an in-and-out. The second round was a test. The top four horse and rider combinations were called back into the ring, and asked to line up. Then, the announcer gave the riders their test, which included a trot jump and a halt. McNerney was called back in fourth place and had to do her test first. "I love going first. I like to be able to set the standard. I though the test was really great, and she's wonderful at trotting jumps," explained McNerney about the test. Not only was McNerney's test great, but was so good that she moved up from fourth place to first, something that does not happen very often. With no huge mistakes from any of the top four riders, the class could have been pinned in a number of ways. However, the judges must have liked the consistency of McNerney's rounds, which gave her the winning edge. The win was great points for McNerney, who aims at qualifying for the Ariat National Adult Medal Finals at the Capital Challenge Horse Show this fall in Maryland. The duo is definitely succeeding in becoming a winning pair. The other riders in the top four all had lovely rounds as well. 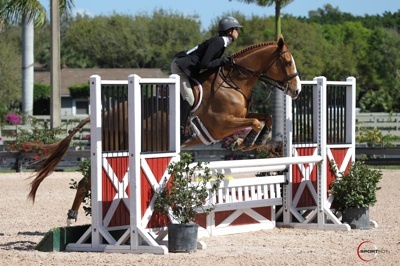 In second place was Samantha Senft riding the Summer Seas Stable entry, Quintos Z. Third place went to Katie Delaporte, who was riding her own horse, Shadwell. The fourth place finisher was Mahala Rummell riding her own horse, Stoney Creek. The class was quite competitive. With none of the fourteen entries making any large mistakes, it was anyone's class to take. As the weekend begins tomorrow, stay tuned for more awards and championships. This weekend will be one of the biggest and most exciting of the season. The $75,000 FEI G&C Nation's Cup will be full of competition and rivalry as numerous countries battle it out in the International Arena tonight at 7 p.m. Tomorrow night, the $35,000 Hermès Puissance will wow the crowd as competitors test their skills over the high jump. Sunday, don't miss the Wellington Equestrian Realty Grand Prix CSIO 4* Grand Prix with a purse of $150,000. The other 11 rings of competition will host numerous hunter and equitation divisions for ponies, juniors, and amateurs.